Every effort has been made to accurately represent this product and its potential. Even though this industry is one of the few where one can write their own check in terms of earnings, there is no guarantee that you will earn any money using the techniques and ideas in these materials. Examples in these materials are not to be interpreted as a promise or guarantee of earnings. Earning potential is entirely dependent on the person using our product, ideas, techniques and the effort put forth. We do not purport this as a â€œget rich scheme. Your level of success in attaining the results claimed in our materials depends on the time you devote to the program, ideas and techniques mentioned, knowledge and various skills. Since these factors differ according to individuals, we cannot guarantee your success or income level. Materials in our product and our website may contain information that includes or is based upon forward-looking statements within the meaning of the securities litigation reform act of 1995. Forward-looking statements give our expectations or forecasts of future events. You can identify these statements by the fact that they do not relate strictly to historical or current facts. They use words such as “anticipate”, “estimate”, “expect”, “project”, “intend”, “believe”, “plan”, and other words and terms of similar meaning in connection with a description of potential earnings or financial performance. Any and all forward looking statements here or on any of our sales material are intended to express our opinion of earnings potential. Many factors will be important in determining your actual results and no guarantees are made that you will achieve results similar to ours or anybody else’s, in fact no guarantees are made that you will achieve any results from our ideas and techniques. 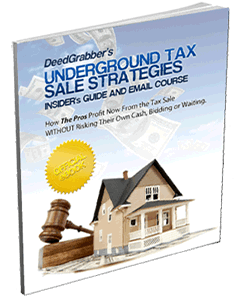 Results vary, and as with any money-making opportunity, you could make more or less. Success in any money-making opportunity is a result of hard work, time and a variety of other factors. 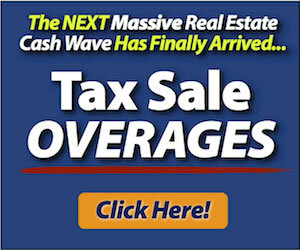 No express or implied guarantees of income are made by www.taxsale.net, www.deedgrabber.com or its owner, DeedGrabber.com, Inc. Images of checks may represent our net profit or, in some cases, be for a gross amount and our resulting profit only a portion (typically 25-50%) of that amount.